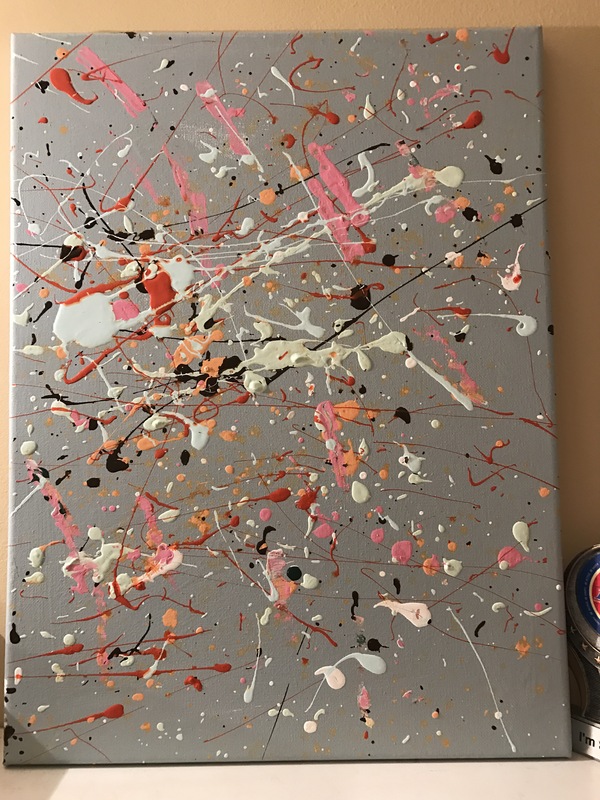 Because I don’t want my kids to be completely ignorant in these areas as well, I decided to take the month of December to focus on doing some arts and crafts, learning about Jackson Pollock (a famous artist from the 1950s), and reading the biography of Amy Carmichael (a missionary to India around 1900.) it was a lot of fun and very pressure free. The Amy Carmichael book I chose to read is from the Heroes Now and Then series. The kids would ask me to read to them about Amy Carmichael each day and beg for more chapters when I was done. You always want to end a book while the kids are still interested and asking for more. It keeps them coming back. Amy’s story is fascinating. She broke many tradition roles for both women and missionaries in India. Her legacy continues in India and the orphanage she started still working today. By reading this book the kids learned about the Caste system, The United Kingdom, and life in the early 1900s. We all loved it! At the same time, we studied Jackson Pollack, an “action” painters from the 1940-50s. I thought that his art would be the easiest for us to recreate, especially since this was our first try at recreating art. It was SO fun and terribly messy. We read a book about Jackson, discussed his paintings and then made our own. To start the project, each child painted the canvas any color that they wanted to use for the base. Then, I pulled out every paint can that I could find in the garage ( which was a lot since I love paint samples and the old owner of our house left numerous cans). 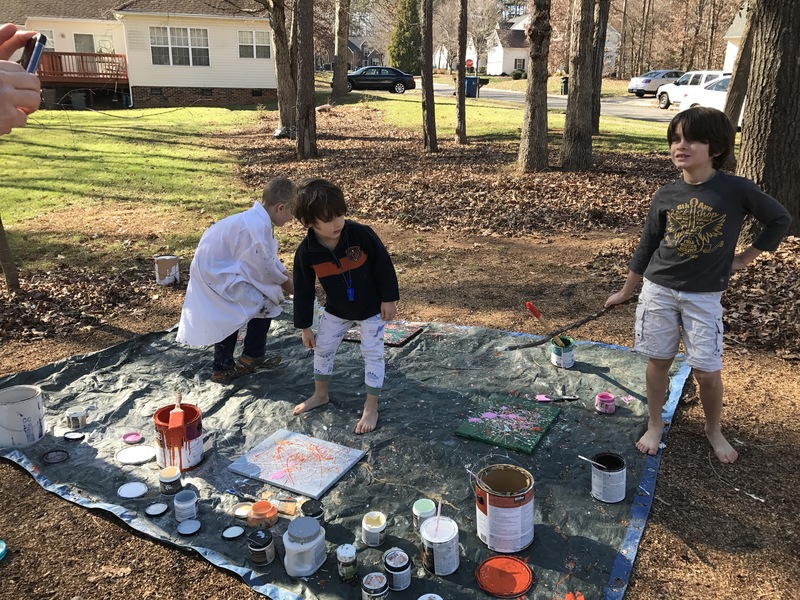 Next, I put all of the open paint cans on a tarp in the front yard, grabbed some paint brushes and long sticks, and let the kids get to work. The kids enjoyed it so much that we did it again when Gabriel and Shepherd were here for Christmas. Here is our set up…..
Each child’s action painting was so different from the others’. This is Miller’s painting. He put a lot of color in the center and then was done…. Faith splattered very little on her canvas’. She insisted on using pink, of course…. Wilson, on the other hand, used so much paint that it took his paintings weeks to dry. It has pounds of paint on it. Wilson really got into his work. He enjoyed the project the most. 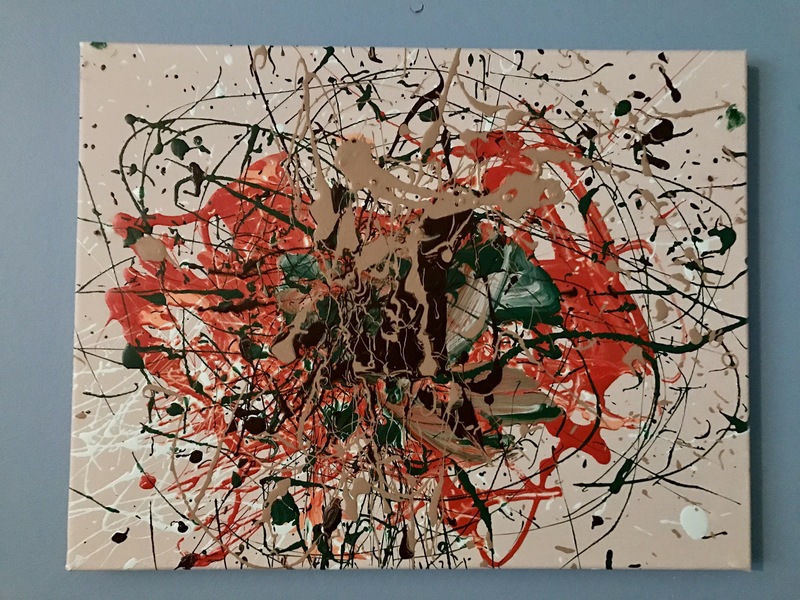 He made three different action paintings and really put the word “action” into it. I hung three of them in the hall bathroom downstairs. Wilson’s are on the outside and mine is in the middle (yes, I got to make one too.). As you can see, the one on the right had so much paint on it that it began to swirl and run together. That one gets lots of compliments as well. We LOVED this project. 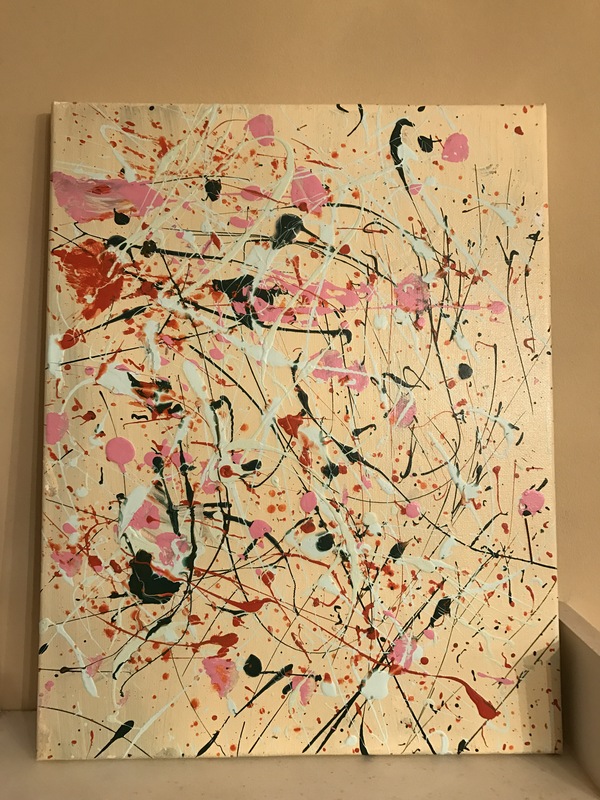 The kids learned about a famous artist and they were able to create their own splatter painting without feeling like they couldn’t do it right. 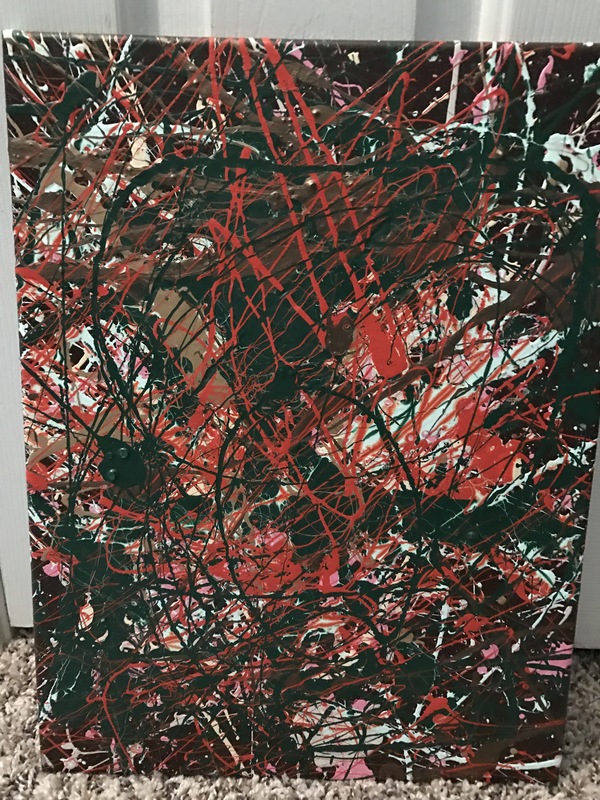 You can’t mess up a splatter painting. I am not sure who we will learn about next. We may just start at the beginning and work our way up! This entry was posted in Uncategorized on February 5, 2017 by Becca.